The BDS course offered by Pariyaram Dental College under Academy of Medical Sciences commenced in December 2004. A six-stories building, having a built-up area of 154,000 sq. ft., and is one of the biggest dental colleges in Kerala. The building includes pre-clinical dental laboratories, lecture halls, a conference centre, faculty offices, administrative offices, clinical treatment areas, small group discussion areas, a faculty practice, and a library. Sufficient area has been earmarked for future expansion and also to commence post-graduate programmes as well as to carry out research activities. The BDS course offered by Pariyaram Dental College under Academy of Medical Sciences commenced in 2003. 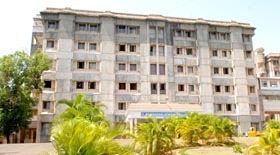 A six-stories building and is one of the biggest dental colleges in Kerala. The B. D. S. Degree is the culmination of a five year program that emphasizes patient-centered care. Students develop clinical skills under close supervision of faculty.